Both boys came down with pink-eye this week, resulting in temporary exile from daycare. Poor Johnnie's looked awful, but passed quickly enough. The entire process of getting prescription drops refilled was ridiculous. Our MD only saw John, but told us to treat Walter as well, so of course we flew through the drops. Then as we had no refills, had to call the doctors office to authorize the pharmacy for more. Of course my doctor was then out of town! After several calls back and forth leading to no resolution for the day, we made it through the night only to use the last drops the next morning, still without scripts called in. Finally, they get it together and my insurance denies the refill b/c it was "too close" from the time in which it was initially perscribed. I get their point, the prescription for only for John, but the doctor says when you treat one you treat both. Insurance companies are not so laid back, however. Fortunately my second insurance picked up the tab. Annoying though! And makes me realize--oh so many things! I would have actually posted more recently but everytime I do, I am getting these crazy comments in, Chinese? I welcome all readers, but comments in a language I don't understand (or the English that is there makes no sense) sort of makes me feel like my blog is being spammed. If anyone knows how I can eliminate/reduce this please let me know! Otherwise, more to come on the boys, but we are doing great here. Lots of fun as they move toward toddlerhood. As I sit here at the pump, gathering the 1.5 oz I have in the middle of my twelve-hour night shift, I am conscious of the delicate balance our life is in right now. There are so many things which rest in a state of perfect functioning, which if god forbid, I or someone were to get sick would knock off. Things like, laundry being mainly completed, or having enough toilet paper at the home. Of course those are trivial items, but with going to school, working and having my heart be at home with the kids and running the house, all these things become big things. I think about financial vulnerability should a glitch in having meaningful work occur. I think of these things and feel grateful that, at least for the time being, god willing everything is a wonderful and amazing "ok."
I have been thinking lately about the process of attachment with twins. Thinking about how object relations come into play with twins. Such that, if I had a single baby, I would probably feel more guilty about setting the baby down to play by himself. However, having two, I always feel that they are happy to plop down and "play" together. They do have their alone time too, but I tend to always assume they want to be together. This really is the amazing side to me of twins. They will have each other throughout their childhood. A constant companion. Someone who always gets it. I just love watching them grow together and interact more each day. Yet it nags at me that maybe I would pick them up more if they were singletons. I catch so few breaks so that now they have longer periods of contentment, I rely on having them play together to get some things done. Sometimes I wonder, "Do they want their mommy or do they want each other?" What do they make of those relationships and do they get that they will always have to share? I suppose it is the constant guilt that is there for mothers with more than one child, the juggle and balancing act of giving each one their fair share of attention. 8 Months? How did that happen? 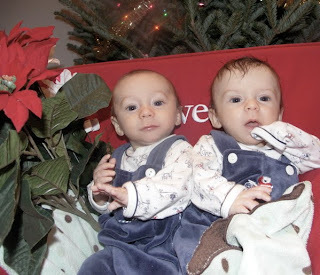 Today on a random trip to a random Illinois town for no other reason then to escape the never-ending chores and housework that is our life with twins, I was lamenting to my husband on the differences in the first year with twins vs. my daughter. Unlike my daughter whose blog I dilligently posted on the new milestones achieved and continuously flooded it with new pictures and videos, these eight months with twins have just gone by in a blur. Between juggling my job, school, kids and life in general it has been a major accomplishment to snap a picture, much less download and upload, describe and post. I feel guilty that I have less of a chronology with these boys. Although I notice a marked difference in the last few weeks/months as far as us having some normalacy return to our lives, it isn't so much that we suddenly have oodles of time. For some reason, 6-month-old resonated with me as appropriate. 8-months seems like well on our way to the one year mark and I am not ready for my babies to be toddlers! These last few weeks have brought about some incredible changes. John is now starting to eek his way backwards, clearly making efforts to crawl while on his belly. Walter, possible on account of his biggish head, is not quite there yet, but is starting to log roll his way around, flipping back and forth happily. Despite increasing bottles, I am still hanging in there breastfeeding 3-4x a day. Not exclusively as I initially hoped, but as this is about when I weaned w/my first daughter I am happy to still be in the running. However I think it is the one factor that is keeping those last few pounds on! But time enough to lose weight, I still want to make it to one year with these babies. Just had another follow up with my OB/GYN and he was accompanied by a student physician assistant during my exam, throughout which he fondly recounted my birth story. It was actually kinda fun to think back to it, as it was such a dramatic moment! I told him all I remember was feeling like I sprayed the room with amniotic fluid and he said, "Yeah well everyone does that!" I remember when the babies were 2-3 months reading a post in a twin forum I go to from a mom saying "At 7 months I am finally enjoying my twins." I understand this completely. While loving them from day 1, the first 6 months have been terribly challenging and I have found over the past few weeks getting more and more rewards. They are sleeping (somewhat) better, but interacting more and having so many cute moments. So rather then hoping for their "content" moments to happen so I can have a break, I look forward to them so I can bond. Some shots from a recent picnic. not that I have not loved and adored them all these months, but we are finally establishing our routines and they are going for more content and playful periods. It is nice to have the breathing room! With my daughter, I thought everything I fed her had to be packaged with something saying the word "baby" on it to know that it was safe. With the boys I am much more free-wheeling and having a lot of fun. My pediatrician gave the green light for foods and sanctioned everything except for honey and encouraging liberal uses of solids to assist with gaining weight. Feeding twins is so fun! While waiting for one to work on his spoonful, I find the other quite ready to take a nibble, so feedings are fast and furious. The menu started simple with bananas, avocado and sweet potato. Now I puree all the foods we eat and they had some corned beef and cabbage for St. Patty's Day and last night ate spaghetti squash with marinara sauce. I am freezing little ice-cube batches of all the purees I make and just love knowing I am feeding them delicious foods that I make and not just relying on the little jars this go round. Nothing like doing a household move to add some chaos to life with twinfants + toddler. I keep telling myself if I can get through this the payoff will be worth it. We are moving from a 3 bed apt in a neighborhood I love to live in a 5 bedroom house in what I call a golf-course, a soul-less western suburban subdivision. Life will improve but will change. Will likely suffer some culture shock. Fortunately my parents have come to assist with the move and their support is just amazing. It really takes the edge off having the extra helping hands around and makes me realize how overwhelming life has been (and will soon be again!). So we will enjoy the help as it is available. Here are the boys! Getting so big....or at least I like to tell myself that! Okay at 5 months I am wondering why I don't post here more. Duh! This is hard. I fought to admit this for a while but as I reach a better place--I do think we are turning a corner here, I can admit that these past five months has been one of the most--probably *the most*--challenging periods in my life. So...feeding. They are deemed "ready for solids" per pediatrician, however I think they are still wobbly in the trunk and am holding off another few weeks. Also, we are moving (great timing huh?) so will give us a week to get settled then will get things all ready. Probably do fruits and veggies as first foods (thinking banana & avocado). Otherwise, still supplementing with formula, still BFing (yay!). The formula is now pediatrician recommended Neosure (or Enfamil Enfantcare) which is the 22 per oz calorie stuff. They get about 4-8oz a day and then BF on demand. I am weaning myself off the Domperidone b/c if it does not allow me to exclusively BF, I don't think it made much difference in my supply anyhow. But nursing is great, they hold hands when they nurse now, they pop off and smile, I am so glad I have stuck with it. Knowing it does not have to be 100% has been the best thing sanity-wise to keep going. They are more fun each day, starting to interact more and it is so great to see their smiles. They are still peanuts--9&1/2lbs! But hey that is almost double their birthweight, so they are going strong, developmentally on track, flipping over etc. It is getting better. I am starting to see the break in the clouds. In my 2nd go-round w/breastfeeding and BFing issues, I can't help but think a lot about it. All I think about is the feeding process of the babies--how can I not, I am constantly nursing, pumping and/or mixing bottles, burping babies, taking herbs and medications to keep my supply up and monitoring what I eat to ensure I get enough calories to feed the babies and don't drink too much wine that the babies get drunk. People say the first 6-8 weeks is the hardest when breastfeeding. For me, it is more like the first 6 months. It never helps that all my babies are slow-gainers. How can I have confidence in BFing when they go on streaks gaining 2oz or even nothing at a time. BFing enthusiasts I turn to for support say, "But they are GAINING, they are not losing." But they don't see the dry diapers and skinny legs that I do that tell me something is up. Even on the maximum amount of galactogogues, including Domperidone which I have to order from Canada, I don't produce enough milk to feed the babies exclusively 100% breastmilk. 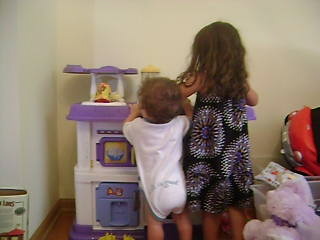 I think if I didn't work and sat at the couch all day with them at my breast, no toddler to look after, it could work. But when I go out the door and they get the bottles, they get formula and I think that is just fine. However, my avid desire to exclusively breastfeed and subsequent disappointment two go rounds now to have it be a more natural process have me thinking long and hard about what lies beneath this desire. It is hard to separate out all the pros and cons, some are so emotional and not something you can quantify. So tonight I am of the mind to break down the numbers. Strictly on the financial side, I have no idea what it would cost to 100% formula feed, but am curious. I read once in a twin parenting forum that their 5-month-old twins go through 20 cans (27.5oz mixes I assume) per month. I just bought a 6-pack of the Vermont Organics Formula, which is one of the more affordable ones, that was $140, so full time at 20 cans works out to be something like $460ish a month, or roughly $5500 for 12 months on formula. That is quite a lot of money, however, as someone who has run into "issues" with bf-ing, I have found it has its hidden costs as well. For me, this is in having to take herbs and meds to keep my supply up--I spend about close to $200 a month on that. I also have had multiple trips to see my LC which is now decreasing in frequency (as a result of increased bottle-feeding and thus weight gain) but that was $50 a pop. I think I spent about $200-300 total so far. I also hired a postpartum doula to help me get started, which was another $300, bought a pump for $300 and wound up renting a hospital grade pump for $70/month per the first three months. Then you figure there is the cost (if you need them) of lanolin, breastpads, storage bags and pumping parts & accessories, bottles, etc. books you may buy, job's tears, you get the picture. My estimate brings us right up to the $4,000 range per a 12-month-period. Let's not forget time is money. While it takes time to make, buy and give formula--that can be delegated out. When you are BFing, only you have the breasts! Should you go this route, my advice is to make sure hubby knows what this will entail. In the first 7 weeks I had my husband in charge of diapering, bathing, rocking, etc while I sat on the couch and worked on latching. He also had to take on the housework as well as doing a lot more parenting of my toddler. I have several friends who have exclusively BF successfully, singletons and twins and never had to deal with above associated costs, but I think that is where it can vary dramatically by individual. I think that if these twins were my first children and I did not have to return to work but was a SAHM with a support system the chances of success would have been, and could be, much higher. For me having to look after a toddler and working part-time were complications that may have derailed me. Despite the struggles I have, I am hoping to nurse them and pump while at work for the year and I would make that choice again. To me, the bonding that occurs is an amazingly beautiful experience. Every drop of EBM I give is just liquid gold. I love the snuggly, cuddly experience and am looking forward to experiencing the BF relationship evolve as they grow. But I have to say, I just love giving my babies bottles too. And I even enjoy mixing formula (though not so much the cleaning part :). Knowing I don't have to BF 100% to have a successful nursing relationship takes away the pressure and reminds me that it can go far. Eventually you are breastfeeding along with giving the babies food and solids etc and they still nurse it is just those first 6 months where the most pressure to provide is on you b/c you are their sole source of nutrition. I think my key lesson learned after everything is flexibility. Despite my growing sense of peace with it, I still cringe when I hear people saying that formula feeding costs more than BFing and the claim that it is "very rare to not be able to produce enough milk for twins or even triplets." It may be true that BFing CAN be simpler and cheaper for the vast majority of those that BF without complication. And I envy that lot. Based on the factors above, I think I will continue to walk the middle line. I am so proud of my success with BFing, but yet I do hear where Rosin was coming from in her Atlantic Monthly article, "The Case Against Breastfeeding." We made it to 2010! Amazing to me how different this year looks from last. The boys are doing great, John will soon have doubled his weight, as he is approaching the 9lb mark! Funny to see them at 4 months still the size of some full-term babies. But they are looking quite wide-eyed etc. lately. The biggest challenge with my twins remains getting them into a schedule and my balance between breastfeeding and the return-to-work bottle feeding. They have shown to do best in the weight gain arena when getting bottles. However I don't pump enough breastmilk so despite my initial seemingly abundant supply of milk, I am now relying on formula to make up the difference. For some reason, I would have thought having twins the formula companies would have targeted me immediately and sent me home from the hospital with samples and coupons. Yet I have yet to receive a single coupon! I am on the prowl at the moment, although the formula I am leaning toward using, Vermont Organics does not advertise as aggressively as the big name companies. Still, I would certainly welcome some freebies! I find both bottle feeding and breastfeeding very satisfying bonding experiences, yet feel very strongly that I would like to make it to a year nursing them. However I think John just loves his bottle! He fusses quite a bit when offered a breast at a feeding. Walter keeps on chugging at either. In this way, I am seeing their personalities emerge! They are starting to play more too and they play in very different ways. Walter likes to sit in his pod and play with the toy on the tray. John likes to be on his back on the playmat and grab at the mobiles. Walter likes to be held during the day, but sleeps very independently, whereas John can entertain himself alone for good stretches during the day but turns into a cuddle bug creature at night. It will be a long road to get this guy in a crib through the night! Hopefully soon he will realize he can cuddle with his brother and be good to go.